Doom won't support modding, but it will come with SnapMap – a bundled toolkit which allows players to build their own levels. The video above is a lengthy overview of the kind of things you'll be able to achieve with the tools (it kicks off at around the 13 minute mark). The bad news is, while it's remarkably flexible for an out-of-the-box FPS level editor, it's not as flexible as the ye olde Doom editors you used in the '90s. If it's architectural freedom you're after, best stick to Minecraft or the original Doom and its sequel. But for those unhappy with some of the modern design decisions shown in the recent open beta, SnapMap will offer ways to annul them. Maps and modes can be created without loadouts, and you'll be able to change both the player and enemy's movement speeds. The damage output of each weapon can be tweaked, as can the amount of damage both the player and enemies can withstand. If you wanna give grunts the huge health bar you think they deserve, well, you can. There's also a thing called "snap points" – basically an XP system that rewards players when they create or consume user-generated stuff. These points can be exchanged for cosmetic rewards. Oh, and someone made a basketball-influenced Doom mode, which you'll also see in the above stream. 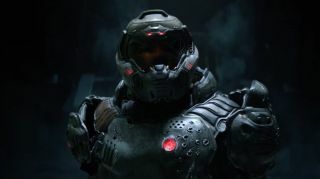 Doom releases May 10.